“Have a really nice afternoon, you guys. Thanks for coming”. We are nearly out the door when this very pleasant, very natural voice wafts over my shoulders. Yeah, right, how many times a day does one hear that much overused cliché – “Have a Nice Day”? Hundreds? Almost every place you go? But somehow this time it’s different – different enough that I turn towards the voice, and get greeted by the most genuine, most engaging smile an aging senior could ever hope to receive. The feeling stays with me right across the parking lot – the staff at the Mission Springs Brewing Company is not just friendly. And not just competent. These people are awesome! A great segue into why we’re meeting this morning. I want to find out more about this amazing beer. A long time institution in Mission, the Mission Springs Brewing Company has all of a sudden become a credible and important member of British Columbia’s craft beer industry, and its reputation has spread far beyond the Fraser Valley. And Kevin Winter has played a major part in that success. 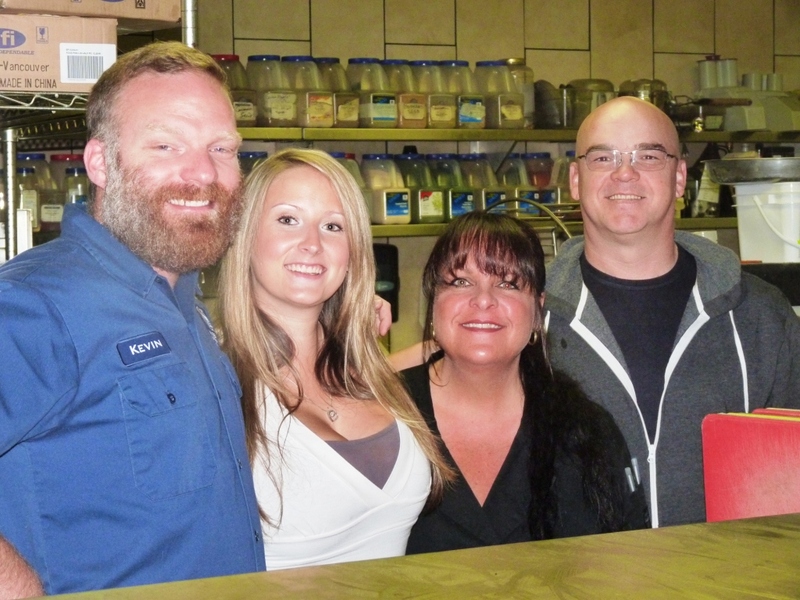 Employed by the Whistler Brewing Company and living in Pemberton, Kevin was attracted to Mission in the summer of 2012 by both the employment opportunity at Mission Springs and the location itself. “I remember the two things that struck me most”, he says. “First was the number of long time employees here at the Springs. Keeping so many employees for 15 years and more told me a lot about the owners. The second thing I remember was the solid family atmosphere of the town itself, and I thought Mission must be a really nice place to live. It’s been a wonderful career move for me”. And a carefully calculated move for the owners. When high school buddies Brock Rodgers and Ken Brookes teamed up in the mid 1980’s to open their Mission Springs Pub, the supply chain was dominated by a handful of national breweries. Mission Springs success, due largely to its offering of great product and atmosphere, was decidedly local. A small brewery was added in 1996 to serve the pub, and a restaurant opened in 2004, but the scope of the business was not much felt outside of Mission. All that changed in 2012. Brock and Ken, recognizing the huge potential of the craft beer industry, made the decision to expand their business. They invested heavily in new equipment, including tanks and bottling and canning lines. Their objective was to bring the culture of high quality craft beer into the entire Fraser Valley, and that took more than equipment. It also took imagination. Barley, hops, yeast and water. “These are the main ingredients I have to work with”, says Kevin. “But not the only ones. We’ve had some real fun around here lately”. Like the Mission Springs radler, for example. In German tradition, a radler was a conveyance used by Germans to get to the pub – a bicycle in summer, a sleigh in winter. Kevin recognized the potential of a low alcohol thirst quenching beverage, and developed his radler around a mixture of beer and lemonade. At 3% alcohol content, this refreshing drink has proved to be a runaway success. Kevin took it to the 2014 Whistler Beer Festival that attracted over 4,000 attendees and 63 breweries. “People went nuts for our radler”, he remembers. “Ours was the busiest booth at the Festival. We must be doing something right, because people are recognizing us from far beyond Mission”. He goes on to note that a good beer culture transcends competition. “The brewing industry in Canada underwent a huge consolidation as a result of prohibition”, he says. “But it’s made a real comeback in recent years. There are now some 85 breweries in British Columbia alone, and that number is rising every year”. Mission Springs brews 15 different beers, but the company is proud to offer brews from around the province and beyond in its pub, restaurant and beer store. “We’re all in this together”, emphasizes Kevin. “Beer is a living liquid, and my goal is always to offer the consumer something different. We are continually looking for the perfect pint”. One of the strong selling features of craft beer is its freshness. Mission Springs brews in batches of only 20 kegs, with the result that each batch is consumed on site or distributed to others in a matter of a few days or weeks rather than months. And demand outstrips supply. “It’s a nice problem to have”, notes Kevin. “It means we can really choose our vendors, and make sure they measure up to our standards of cleanliness and turnover”. At present Mission Springs self distributes product to pubs and over 100 beer and wine stores from Agassiz to Whistler. Its Trailblazer Pilsner won a gold medal in the 2014 Best in Canada competition, and Kevin has high hopes for his brews in provincial competitions as well. In addition, the brewery is strongly committed to a buy local policy, for example, purchasing hops from the Columbia Valley south of Cultus Lake. In the meantime, Kevin Winter keeps experimenting, searching for that elusive perfect pint. He shows off wine casks where he is aging some of his beers, as well as other ingredients he plans to add. “2016 is the 100th anniversary of the Canada Temperance Act”, he says, flashing his trademark grin. “You can be sure we’ll have a lot of fun with that”. With over 100 full time and part time staff, most of them living close by, Mission Springs Brewing Company has grown into a major local employer. It has become a leisure time destination for out of town patrons, and has gained wide recognition for the excellence of its products. A proud contributor to the local economy, it has also helped to place Mission prominently on the provincial map.